Is bath time your least favorite part of the day? Even worse — is it your toddler’s least favorite part of the day? There’s nothing like ending a long, exhausting day with a meltdown: a bad bath can ruin your night. Worst case scenario, a bad bath time can push bedtime back even further. There’s nothing like a cranky, overtired toddler to make you wish you were anywhere else. But I’ve decided it doesn’t have to be that way anymore, and here’s why. I am done with bath toys that don’t bring my baby joy. I’m even more done with bath toys that ooze slimy water and need to be cleaned constantly. My family and I are breaking up with every bad bath toy we’ve ever had — and you should, too. It’s time to make baths fun again. 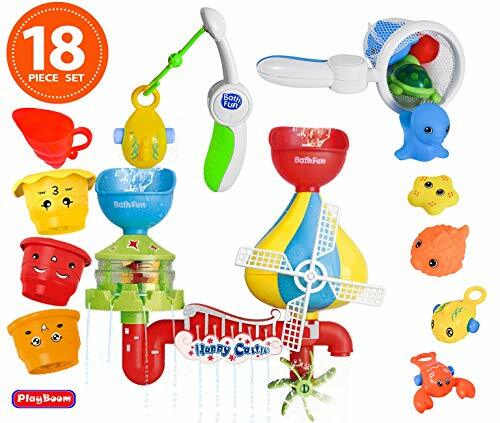 Here is a list of bath toys that won’t disappoint you or your little ones. What Kind of Toys Are Right for My Baby? Baths are a great tool to have in your bedtime routine. They can help your baby begin to process their day and prepare for sleep (source). Used effectively, a bath can signal and help trigger an easy transition to bedtime. But a bath can be so much more than just a segue into sleep. It’s a time for you to bond with your baby. It’s a moment for your child to continue their essential task of exploring, playing, and learning in a different environment. You want to look for toys that will encourage this kind of growth and imaginative play. Whether you opt for foam letters, fine motor skill toys, or those geared toward creative play, will depend on what you and your child prefer (source). Regarding quality, I have the same standards for bath toys as I do with regular toys. Pay attention to where your toys are manufactured and make sure they can be exposed to heat. Even if your baby’s bath water is at room temperature, there’s no guarantee the toys won’t be affected by your hot shower steam. Now that you know what I look for when shopping for bath toys — engaging, safe, and easy to clean — maybe you have more idea of what you’ll want in your bath toys. I won’t keep you in suspense any longer: here are my favorite bath toys. Baby baths are likely to be taken in a contained space, like a small baby tub, or even a sink. We’ll call them toys, but baby bath items will usually be something in an interesting texture that the baby can hold and feel. Toys that provide visual interest and stimulation are also great. 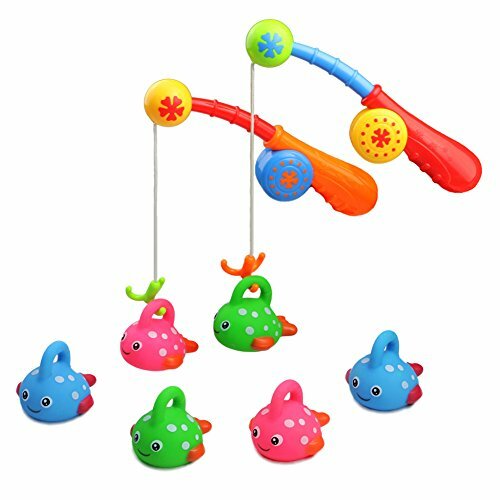 As far as baby bath toys go, I can’t get enough of the Yookidoo baby bath mobile. This sensory toy provides gentle mental stimulation and distraction during bath time. I love that the water feature helps desensitize your baby to water spray in a fun way. The mobile fits a wide variety of tubs, grows with your baby into toddlerhood, and stays out of the way for when the rest of the family need a shower. It’s easy to keep clean. It’s entertaining for the baby during bath time. A bonus is that you don’t need to collect lots of small parts to put away afterward. Toddler baths are where the fun really begins. This is a great time to introduce reading aids and toys that promote motor skills. Even reaching for toys in the water will help develop dexterity and gross motor abilities. Don’t let this opportunity pass you by with meager toys or a toy selection that doesn’t interest your child. My favorite toddler bath toys are this take on foam letters. I love that it gives you a variety of skills to develop. Using their motor skills, toddlers can catch the floating toys and practice sticking them to the walls and side of the tub. 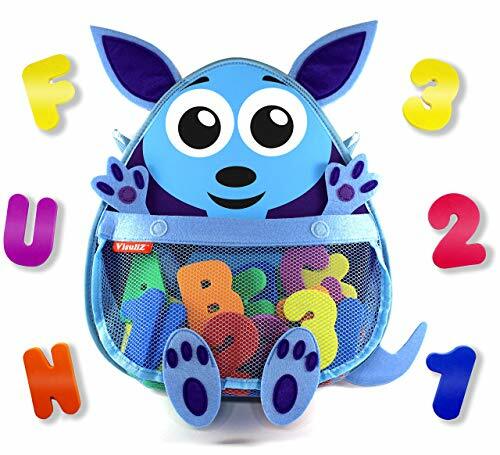 Just like with a foam alphabet, you can help your child learn the different names of the animals, their numbers, and colors. It’s a great spin on a classic bath toy. They won’t even realize they’re learning. My kids love books, and I believe you can never provide them with too many. Bath time is as good a time as any to push reading. My favorite bath book set is this collection of books from BabyBibi. I like the different learning opportunities they provide for children. If your baby is at a place where color and objects are still new, these books are great. If, however, your child has already mastered those skills, there’s enough artwork in this collection to focus on counting. The art is eye-catching and the books are made out of quality materials. Every child needs a rubber ducky. 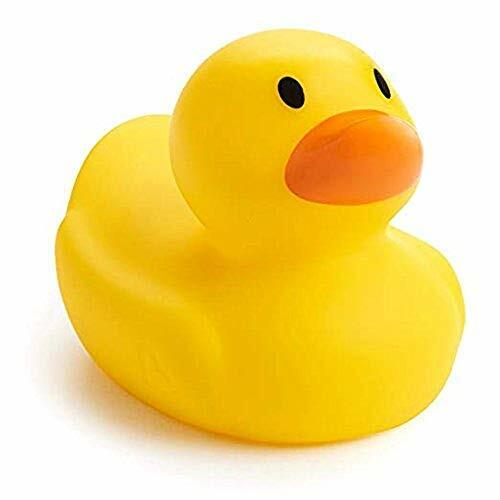 This is your simple and classic yellow rubber ducky for the bath. What I love about it, though, is that it doubles as a safety precaution — it’s a thermometer in disguise. If the water is too hot for your baby, the word “HOT” appears in white on your yellow ducky. You have enough worries to contend with during bath time. Thanks to this little toy, the temperature of the water doesn’t have to be one of them. Kids love music. They also love bubbles. It doesn’t get much better than a toy that can bring both of those together at bath time. This bubble maker is eco-friendly and has passed rigorous safety testing. What do I love best about it, though? I can use the same baby body wash that I love for my sensitive-skinned babies, to make the frothiest bubbles imaginable. 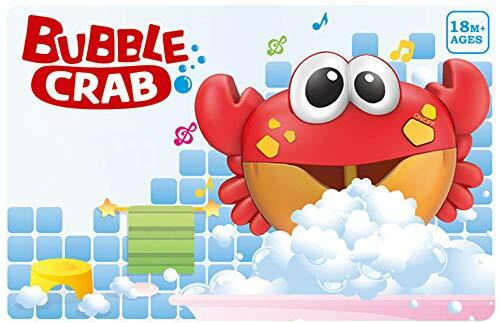 The crab plays 12 different nursery rhymes, which only adds to the fun. It does run on AA batteries, so you’ll want to make sure it’s affixed securely outside of the tub or basin. 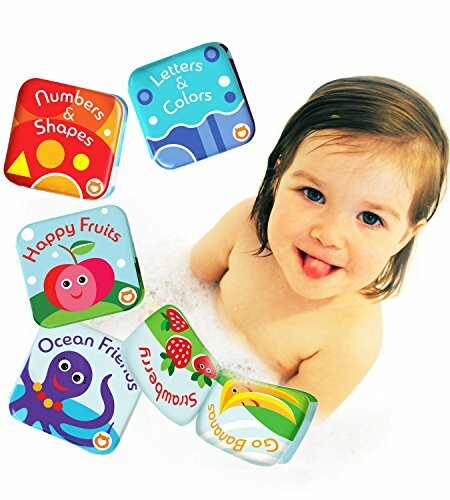 If you are looking for an interactive bath toy that pushes analytical thinking, this might be the one for you. 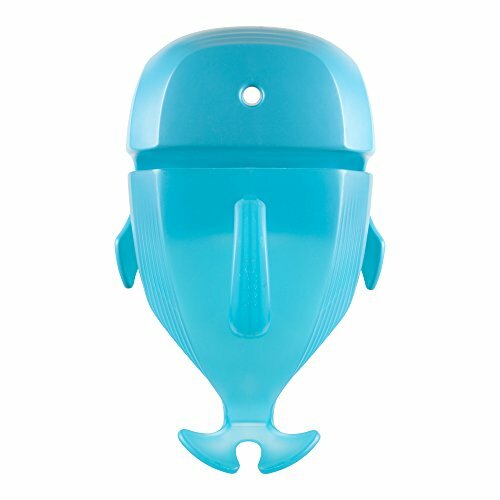 This toy attaches to the wall or bathtub via suction cups. Once it’s fixed, your child can pour water into the station and create their own waterfall. Your baby will develop coordination skills — standing in the water, collecting water, pouring it into the reservoirs — while having a good time. The benefits don’t stop there, though. Your child will get to see how the gears operate, and to experiment with large and small amounts of water. Why let bath time be boring when it can be such a great learning opportunity? Nothing is going to help develop those fine motor skills faster than writing implements. If you’re looking to encourage little ones to work on fine motor skills, bath crayons are a low-pressure way to do it. 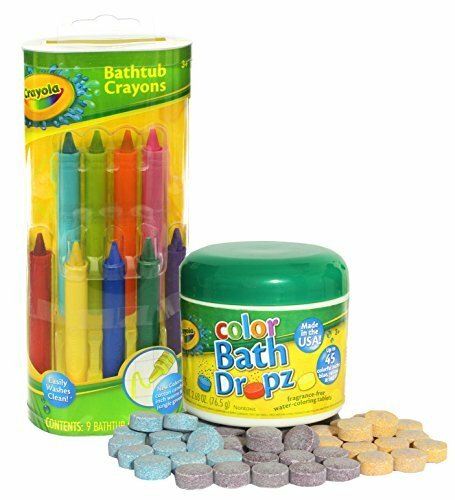 These crayons are toxin-free and wipe clean from the walls after bathtime murals are complete. They come in a great variety of colors and won’t irritate sensitive skin. Go ahead and let your little ones practice holding those crayons. Here’s another safety measure, thinly veiled as a toy. Have you ever watched your little one hit their head on the faucet or end up with a face full of water? If you have, I don’t need to tell you why I love this little whale so much. In a matter of moments, this rubber covering slips over the faucet and covers hard edges. You’ll receive a set of two and an additional accessory so that you can alternate for variety. Easy enough for you to remove — but not easy for little fingers to interfere with — and BPA-free, there’s really no reason to pass this up. I love that this fishing set comes with two fishing rods. Instead of fighting over who gets to use the fishing rod next, your kids can get right to the fishing. This is a great activity to improve hand and eye coordination, and practice patience. The colors in this set are attractive and fun, and the materials used in its construction are soft, durable silicone. This set has passed safety testing, is toxin-free, and easily cleaned. Foam bath letters are a classic bath toy for a reason. They provide a great opportunity to introduce colors, sounds, and other early reader skills. These letters are safety tested, float, and stick easily to the tub or bathroom walls. 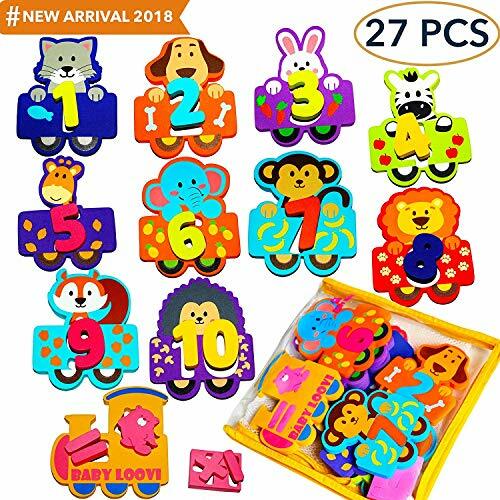 This letter set includes numbers 0–9 as well. 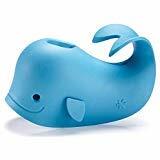 Perfect for little fingers to trace and identify, this is a bath toy that’s more than just fun. It’s a great educational tool that you can sneak in under the radar. Now that you’ve picked out your next bath toy additions, you may find you need help organizing them. If you do, here are some of my top suggestions for bath toy storage. Are you looking for a caddy that allows bath toys to drain into the tub and is easy to remove once dry? If so, this could be the one for you. This caddy is made from hard plastic, is mildew resistant, and is designed to span across the bathtub. It’s great for containing toys during the actual bath while still leaving them accessible to your child. Have more bath toys than you know what to do with? 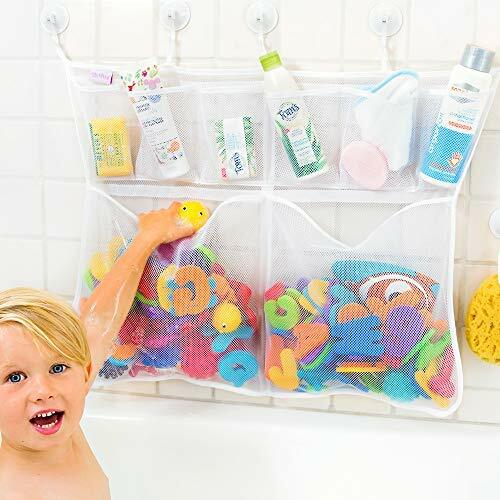 Think there isn’t possibly a bath toy organizer that’s up to the task? You might just need this oversized caddy in your life. Made of mesh that allows the toys to drip dry and is also easy to launder, this piece keeps your toys clean, mold-free, and out of the bottom of your tub. 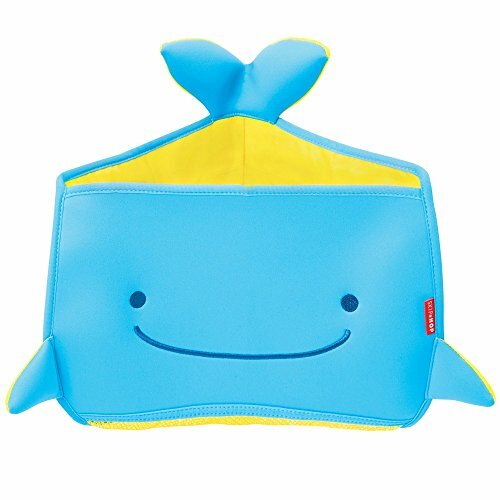 If you like your storage units to be more than just utilitarian, this cute little whale might be what you’re looking for. It provides adequate drainage and even storage for body wash and shampoo, without looking like a toy container. This storage scoop isn’t suited for too many toys. But if you have just a few looking for a place to call home, this is a great option. 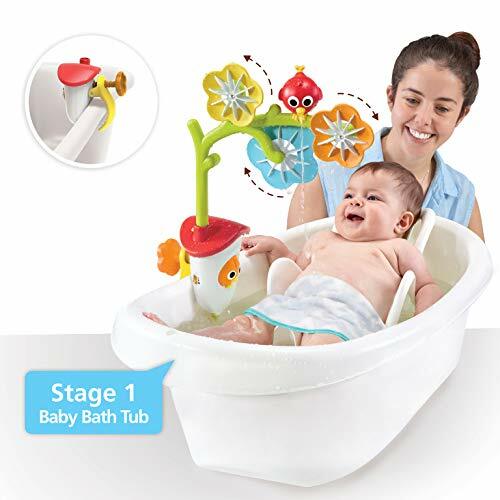 It easily mounts with adhesive strips and effectively reduces the risk of mold and mildew growing in your baby’s bath toys. 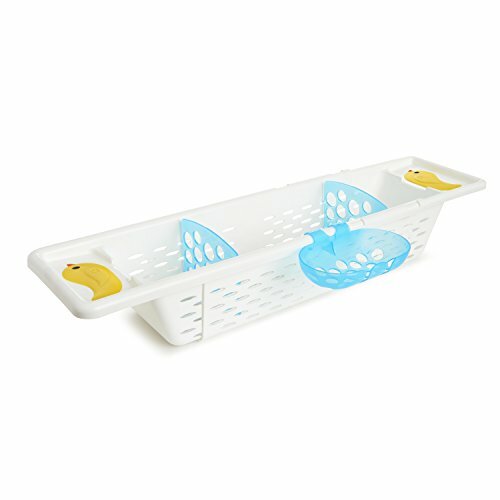 You may find an engaging bath toy holder will encourage your little ones to help you clean up the toys after their bath. This mesh and neoprene kangaroo with velcro paws is cute as well as functional. The high-quality materials are mildew resistant, BPA- and phthalate-free, and certified safe. The included mounting pieces can hold up to 20 pounds, and plenty of bath toys. This particular storage unit comes with a set of foam letters to get you started. Have an awkward space you need to make the most of? Or do you just hate that the corners over your tub serve no real purpose? You might be interested in a corner storage unit for your toys. This corner unit sports an appealing whale face and a mesh base for easy drainage. It’s made of neoprene, is machine washable, and fully adjustable with suction cups for easy use. It opens at the top for ready access and to increase airflow, and easily fulfills your storage needs. Your toy selection will hinge on a couple of important factors. The first is going to be the age of your child. A new baby’s needs in a bath toy will differ greatly from the wants of an older toddler (source). The next factor you should consider is your child’s personality, and the kind of toys they most enjoy. If your child loves to build, a block system they can use in the water could be the perfect fit. If they love animals, pick up a collection just for bath time. It’s great if you can move your children out of their comfort zone and get them interested in a special type of toy that they only have access to at bathtime. It may take a while, though — especially if you have a child who doesn’t look forward to bathtime. Don’t be afraid to use tried and true toys, while slipping in the occasional new one. Two things get me all the time with bath toys. The first is how to store them. The second is how to clean them. Imagine this — you stagger into the bathroom ready for the fastest shower known to man. The next thing you know, a small toy with a name you can’t remember is wedged between your toes. Maybe you don’t even have to imagine this scenario, and you’re just remembering your shower from this morning. I have to confess that this was my morning routine for years, before I bucked up and invested in a storage system for my kids’ toys. It took me a while to find what worked for us, but I can’t recommend it enough. If you’re anything like me, you think new bath toys are great, and so do your kids. That is, of course, until they’ve been around for a little while. Then you wonder what kind of germs they might be harboring. I spent a long time searching for the perfect way to clean my bath toys, in the hopes I wouldn’t need to replace them as often. This recipe for clean toys is simple, effective, and cost-efficient. If you have more than one child in the bath, you’ll find you need to do less to encourage playing during bath time. If you’re only bathing one little munchkin, however, you’ll probably end up being the playmate. Expect to be down on the floor next to your tub during bath time. Dress to get wet; at the very least, you’ll need to have your hands and arms submerged in the water up to the elbows. Realistically, though, you will probably be readily splashed and soaked to the skin yourself by the end of bath time. The best way to get a child involved in playing is to model the activity (source). Grab a toy, move it through the water, and demonstrate how to use it — for added involvement, I always recommend sound effects. If it looks like you’re having a good time, your child will want to be a part of it. Once your child is involved in play, feel free to drop back and give them the reins. They’ll either re-engage you on their own turf, or they’ll be content to enjoy creative play on their own. Either way, your little one will be calling the shots and pushing themselves toward developmental growth. If you’ve been dreading bath time, you don’t have to anymore. The right bath toys and accessories can change how you approach your end-of-day routine — for the better. There are so many great options here. 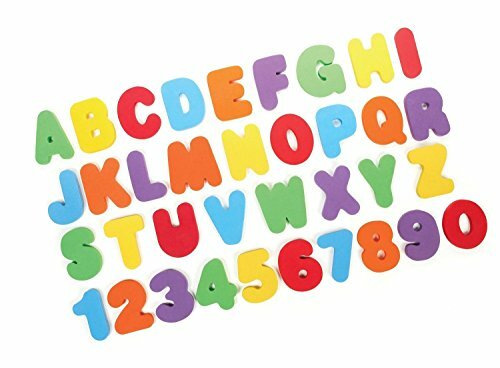 But if I were able to choose only one bath toy, it would have to be the Little Tikes Bath Letters and Numbers. I love the many variations of learning games you can play with them — and your child will think it’s all just bath time fun. Foam letters are easy to care for and clean. They also store well and encourage tactile and cognitive development. There aren’t enough good things to say about introducing letters early and consistently to your children. What toys will you be bringing home next? Does your child have a favorite bath toy that they can’t live without? We’d love to hear about it — leave a comment below!